Who knew that your community greenhouse, garden center and nursery would feature a home décor shop with some of the most fun, interesting and eclectic pieces of unique home décor found anywhere? This is one of the biggest surprises for our first-time visitors. The interior designers at Creek Side Gardens Indoor Living Décor and Gift Shop are challenged every season to find the home décor furniture, accents and gifts that reflect the best of what is happening in the home décor world. Then we create displays that provide inspiration to our guests for decorating their own homes. So wonderful decorating ideas are what you will find when you visit the Indoor Living Décor and Gift Shop. Indoor Living Fall Decor & Gifts Don’t miss out on this opportunity to add fall decor to inside your home. Beautiful, realistic Fall wreaths, garland & accents to decorate a table top, mantle or over a doorway or window. 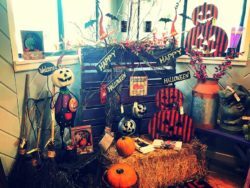 Fun Halloween ornaments, dish towels & yard art to help get you or a gift recipient into the season. Find great fall-themed Hostess gifts such as candles, towels & room accents. Through the beautiful hanging baskets, flowering container gardens and flower pots grown right in our own greenhouses, Creek Side Gardens reflects the best of what outdoor living is all about. Which is celebrating the outdoors by creating beautiful spaces on our patios and in our gardens. Our Indoor Living Décor and Gift Shop extends that celebration to our homes by reflecting the best of what indoor décor for indoor living is all about. Meaningful living spaces are created by incorporating original and unique accents that make us feel good about where we spend our time and how we live our lives. Our home décor is a reflection of those positive feelings and searching for those accents to reflect those feelings gives our lives a little purpose, a little challenge, a little fun. Whether you are content to browse or whether you are on a mission to fill a unique home décor need, Creek Side Gardens is a wonderful place to visit and spend some time. Our creative decorating ideas and suggestions may be just what you were looking for to help enrich your life.